Posted in MUSIC, Performers, Press. MONDO LUCHA! THEME SONG with THE SUSPIRIOS! Our old pals MARITIME ‘Enjoy the silence” ….and sign with DangerBird ! 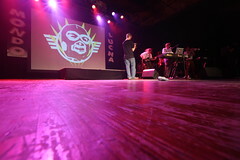 Special Musical guest, KID MILLIONS, tore it down at the MONDO LUCHA HOLIDAY SPECIAL in November 2009. A great addition to our world, I’ve never seen our crowd get down like that in the big send off at show’s end. Posted in MUSIC, Performers. Tagged Performers, Video.